Once cake is mixed according to package directions, add the zest of two lemons. Pour 1/3 of the batter into a microwave-safe 9x9 baking dish and microwave for 2-4 minutes, just until the cake springs back to the touch. Crumble the cake into a large microwave-safe bowl, and continue to microwave until the cake is fully cooked. Crumble and cool fully. Cook the remaining cake batter in like manner. Add a few spoonfuls of the frosting into the crumbled cake. Stir. Continue to add frosting, just until the mixture resembles the texture of Play-Doh. Roll the cake mixture into five 3 inch balls. Slice each ball in half with a sharp knife, then slice each half into three lemon slices. Use your fingers to form each slice into nice shapes before dipping. Microwave the candy melts in a medium, deep-sided microwave-safe bowl just until melted. Stir until smooth. Dip the top 1/2 inch of a sucker stick into the candy melts, then gently press it into the large end of a cake lemon slice. Repeat with remaining cake slices. Allow candy melts to harden completely around the sucker sticks. Then dip each cake slice into the candy melts, one slanted side at a time. (You'll do the bottom next a different way so just do the top slanted sides for now.) Gently press a 1 inch mini straw (i.e., coffee stir stick) into the top side of each slice, then press the bottom of the sucker stick into a piece of floral foam so the cake pop stands upright until the candy melts are hardened. When the sides are hardened, re-melt candy melts if necessary, and use a knife to spread candy melts on the bottom of each slice. Then sprinkle with the colored sugar. Return to the floral foam and allow to harden completely. Melt the white chocolate chips in a microwave-safe bowl and stir until smooth. Transfer to a zip-top bag, snip a small corner from the bag, then pipe triangles onto the straw-side of each pop to resemble a fruit slice. Sprinkle with white or clear sparkling sugar. Store cake pops upright by pressing sticks into floral foam. When completely hardened, they can be served or wrapped in cello candy bags for gift giving. Get your summertime sippin' on with a strawbery lemonade dessert so sweet, it'll make you forget all about the liquid version! 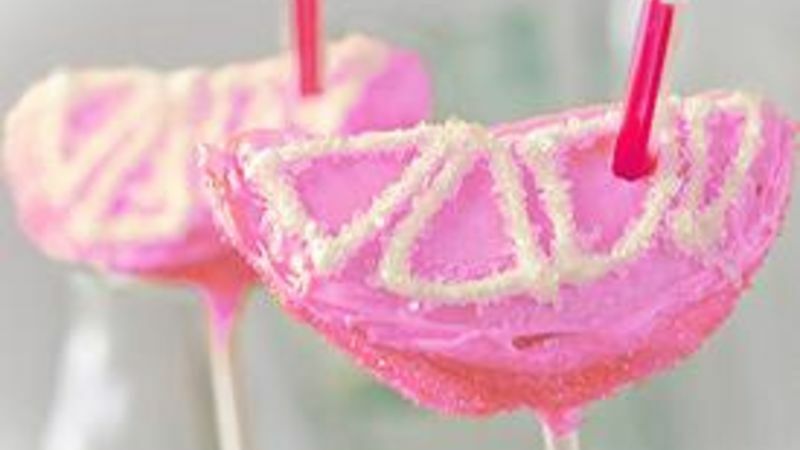 These Strawberry Lemonade Cake Pops are a fun twist on the hottest trend in treats since chocolate lava cake. And these, with their cute coloration and hint of lemon zest, are just perfect for summer. Here's how to make a batch of your own, filled with a delicious strawberry-lemon cake and cool cream cheese frosting. We made ours pretty pink just for kicks, but you could make yours lemon yellow or any color you want! Just choose a different color of candy melts for the coating and you're set to go. Prepare a Betty Crocker Strawberry cake mix with fresh-grated lemon rind! Cooking's a breeze in the microwave (not kidding!). Crumble the baked cake into a large bowl and add a few spoonfuls of Betty Crocker frosting to the cake crumbles. Stir and continue to add frosting, just until the mixture resembles the texture of Play-Doh. Roll the cake mixture into five 3" balls. Slice each ball in half with a sharp knife, then slice each half into three "lemon slices". Use your fingers to form each slice into nice shapes before dipping. Microwave the candy melts into a medium, deep-sided microwave-safe bowl just until melted. Stir until smooth. Dip the top 1/2" of a sucker stick into the candy melt, then gently press it into the large end of a cake "lemon slice." Repeat with the rest of the cake slices. Allow candy melts to fully harden around each stick so the sticks are secure in the cake. Then dip each "slice" into the candy melts (re-melt if necessary so the candy is smooth and easy to dip into). To keep the slices from falling off of the sticks, press the slanted sides of the slices into the candy melts first. Gently press a 1" mini straw (like a stir-stick for coffee) into the top side of each slice. Press the bottom of the sucker stick into a piece of floral foam so the cake pop remains upright until the dipped edges of the cake pops are hardened. Use a knife to spread candy melt on the bottom of each slice, then sprinkle that side with colored sugar. Return to the floral foam and allow the bottom edge to harden. Melt the white chocolate chips in a microwave-safe bowl and stir until smooth. Transfer to a zip-top bag, snip a small corner from the bag, and pipe triangles onto the straw-side of each slice to resemble fruit slices. Sprinkle with white or clear sparkling sugar. Store cake pops upright in the floral foam until completely cooled and ready to sip….er….nibble!